We also provide a forum in which our members share their experience and knowledge. Our members collectively have hundreds of years of experience in ESL teaching and running ESL programs, and our interactions with one another are educational and enriching. ESLIM is a support organization – it does not offer English classes itself, but supports churches that offer ESL programs. Ownership of this ministry belongs to local congregations so that they may be connected in ministry to the neighborhoods that surround them. So long as our standards of quality are maintained, your program will retain full autonomy to run its program in accordance with your church’s priorities and needs. 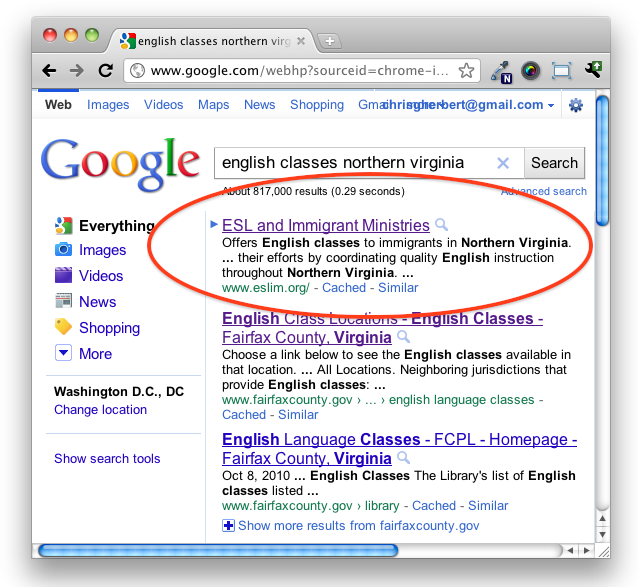 ESLIM is one of the oldest faith-based ESL programs in Northern Virginia/DC, so our “brand name” has tremendous value. 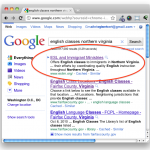 The ESLIM website consistently ranks highly in Google for important searches like “English Classes in Virginia,” which means that we are one of the first places that potential students and volunteers check on the Internet. ESLIM provides intensive day-long training workshops for new volunteer teachers and shorter “Refresh and Renew” workshops for returning teachers. The workshops are led by professional English as a Second Language teachers. ESLIM member churches may send teachers to our training programs at no cost. (Attendees from other programs will be admitted on a space available basis for fee of $75 per person.) Advance registration is necessary for all attendees. ESLIM conducts advertising campaigns in August/September and December/January, in languages that have included Spanish, Korean, Vietnamese, Arabic, Japanese, Chinese, Farsi, and English. Our publicity has included both radio and newspaper advertising, as well as our website. Interested students are directed both to our website and to our voice mail. Volunteers are the lifeblood of every program and locating volunteers can be difficult and time consuming. Local counties and cities maintain websites for persons seeking volunteer opportunities. ESLIM maintains current listings on all these websites. Our website also has a volunteer application form. Our Program Administrator personally contacts each potential volunteer to screen them and place them with church programs that need teachers and assistants. How Much Does It Cost to Belong to ESLIM? ESLIM is supported in large part by our generous donors. We engage in fundraising efforts through direct mail to reduce the costs to our member churches. We are grateful for donations from churches as well. Since the Fall of 2013, our fundraising has been successful enough to allow member churches to participate at no cost, which enables our members to increase their investments at the local level. We hope that we will be able to continue free membership in future years as well. Historically, in years where our donations have not been sufficient to fully fund our program, the costs of running ESLIM that were not covered by donors has been divided among our member churches in proportion to the student enrollment at each church. Read the Membership Standards page for more information on joining ESLIM.